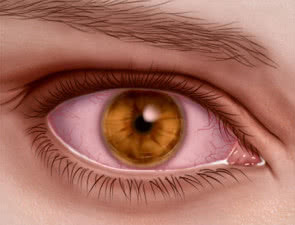 Keratitis is a relatively common inflammation of the cornea. This inflammation may be caused by bacteria, injury to the eye, or dry eyes, and is associated with some medical conditions (such as thyroid disease). Prompt diagnosis and treatment of keratitis is necessary to avoid poor outcomes, such as corneal scarring. Treatment often involves antibacterial, antifungal, or antiviral eye drops, or in some cases, oral or intravenous medications. Contact lens wearers: People who wear contact lenses are at a greater risk of developing this condition. Contacts must be properly cared for, and lens wearers should wash their hands thoroughly when taking out and inserting contacts. Wearing contacts for longer than recommended (such as overnight) can also be a risk factor. Immune diseases: People who have immune system diseases such as HIV/AIDS, or who are undergoing chemotherapy, are at a greater risk of developing keratitis. Steroid eye drops: Using eye drops that contain corticosteroids can increase a person’s risk of developing keratitis. In some cases, when the condition has gone undiagnosed, the use of steroid drops can make the condition worse. Tropical climate: Those who live in areas where the weather is warm and humid are more susceptible to keratitis. What Are the Various Types of Keratitis? Keratitis can be either superficial or stromal. Superficial keratitis affects only the top layers of the cornea, while stromal keratitis affects the deeper layers of the cornea. Keratitis may be chronic or acute, and may occur in either one eye or both eyes. Keratitis is further classified as infectious or noninfectious, depending on whether the inflammation is caused by an infectious agent or not. Infectious keratitis: A scratch or injury to the cornea can leave it vulnerable to infection from a variety of organisms, but infection can also occur without any prior injury. Several different types of bacteria have been found to cause infectious keratitis, most notably Staphylococci, Hemophilus, Streptococci, and Pseudomonas. Viruses that are commonly found in infectious keratitis are adenoviruses, herpes simplex, and herpes zoster. Fungi such as Candida, Aspergillus, and Nocardia can also cause keratitis. Infection with an amoeba that is rarely diagnosed in the United States, but common in developing countries is acanthamoeba keratitis. In developed countries, acanthamoeba keratitis is most commonly found in contact lens wearers. Noninfectious keratitis: This can be caused by an injury to the eye, or by allergies that affect the eyes. Keratitis may be diagnosed after a physical examination by an eye care professional such as an ophthalmologist, who will look at the condition of the eye, taking note of redness or discharge, and ask the patient about any other symptoms, such as pain or blurry vision. A slit lamp may be used to take a closer look at the eye, specifically the cornea. A slit lamp is a tool that has a high-intensity light and a microscope. During examination with a slit lamp, patients sit with their chin and forehead supported, while the examiner shines the light into the eye and looks closely at it with the microscope. Dye may also be applied to the cornea with a paper strip or through eye drops, in order to make the structures of the eye more visible. The dye will not affect the patient’s sight, and should dissolve away fairly quickly. In some cases, the eyes may also be dilated. With the pupils enlarged, it is easier to see the inside and the back of the eye with the slit lamp. Patients may experience blurry vision and more sensitivity to light while the pupils are dilated. Because keratitis can be caused by bacteria, a culture may also be taken. Anesthetic eye drops may be administered, and the culture is taken by gently scraping the cornea with a sterile spatula. A sample of any discharge or tears from the eye may also be collected and sent out for culture. What Are My Treatment Options for Keratitis? Treatment will depend on the type of disease that is present: noninfectious or infectious keratitis. In most cases, this condition can be treated at home, but in severe cases where systemic antibiotics must be given, hospitalization may be needed. Noninfectious keratitis: If there is no bacteria present in the eye, treatment could include wearing a patch over the affected eye. In the case of keratitis from an overuse of contact lenses, discontinuing the contacts for a time is recommended. Eye drops may also be given. Infectious keratitis: If there is any foreign material present in the eye, it must be removed. In many cases, treatment for infectious keratitis involves antibacterial, antifungal, or antivral eye drops. In some cases of bacterial keratitis, oral medications such as antibiotics may be prescribed in addition to antibacterial eye drops. If there is a fungal infection present, antifungal eye drops are used, sometimes in conjunction with an antifungal medication. Keratitis caused by a virus is often treated with antiviral eye drops or medications. Acanthamoeba keratitis (infection by a type of protozoa) is relatively uncommon in the United States. How Can I Prevent Keratitis? It is also important to have regular eye exams, treat underlying eye conditions that may cause keratitis, and wear eye protection when eye injury is possible. What Complications of Keratitis Should I Know About? In most cases, this condition is superficial, and does not cause any complications. There, are however, some potentially serious complications of keratitis that goes untreated or that involves the deeper layers of the cornea. Chronic keratitis: In some cases, this condition becomes chronic and recurs after treatment. Corneal scarring: When keratitis has affected the deeper layers of the cornea, scarring is possible. A scar is permanent, and it can affect vision if it appears in the wrong part of the cornea. Corneal perforation: With severe keratitis, there is a risk of a corneal perforation. A corneal perforation (a tear or hole in the cornea) is most often treated with surgery. Dart, J. K., Radford, C. F., Minassian, D., Verma, S., Stapleton, F. (2008) Risk factors for microbial keratitis with contemporary contact lenses: a case-control study. Ophthalmology. 115(10), 1647-1654, 1654. e1-3. doi: 10.1016/j.ophtha.2008.05.003. Green, M., Apel, A., Stapleton, F. (2008). Risk factors and causative organisms in microbial keratitis. Cornea. 27(1), 22-27. doi: 10.1097/ICO.0b013e318156caf2. Jhanji, V., Young, A. L., Mehta, J. S., Sharma, N., Agarwal, T., Vajpayee, R. B. (2011). Management of corneal perforation. Surv Ophthalmol. 56(6), 522-38. doi: 10.1016/j.survophthal.2011.06.003. Seal DV. (2003). Acanthamoeba keratitis update-incidence, molecular epidemiology and new drugs for treatment. Eye (Lond). 17(8), 893-905.